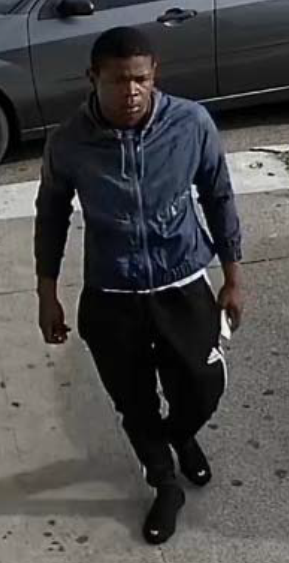 On June 26, 2017 at approximately 6:38 p.m., the pictured suspect robbed and beat the victim in the 7100 block of Chaucer Place. The victim was violently assaulted by the suspect and knocked unconscious. The suspect went through the victim’s pockets and took his property. The victim survived his injuries. The suspect is described as a Black male, 18-20 years old, 5’10” tall, and 180 pounds. The suspect was last seen wearing a blue hooded jacket, black Adidas pants, and black tennis shoes. The suspect drove a charcoal grey Ford Focus with black rims and dark tint. Anyone that recognizes this suspect or has information on this offense is asked to call Detective Mulvihill at (214) 671-3705. If you wish to remain anonymous, you may call Crime Stoppers at (214) 373-TIPS (8477).